13-year-old Hana Chang began playing violin at age 4 with Klaudia Szlachta and currently studies with Prof. Ivan Zenaty of the Cleveland Institute of Music (CIM) under the Junior Young Artist Program. Her past teachers also include Prof. Yuri Mazurkevich of Boston University and Miguel Perez-Espejo Cardenas. Besides violin, she studied viola for the past three years with Peter Sulski. As an avid chamber musician, she has played in groups at CIM, the New England Conservatory (NEC) Preparatory School and at the Lexington Chamber Music Center. Hana has won numerous competitions including the Young Promise International Festival and Competition (2010), the Concord Orchestra's Ehlers Young Artist Concerto Competition (2014), the Wellesley Symphony Orchestra's Young Soloist Competition (2014) and the NEC Prep Concerto Competition (2014). In September 2015, she was a semi-finalist in the Lipinski Wieniawski International Competition for Young Violinists held in Lublin, Poland. 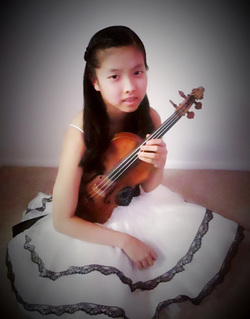 Hana gave her first solo performance at age 7 with the NEC Baroque Chamber Orchestra and continued to perform solos with the orchestra for the next two years. Hana has performed solos with the Lexington Symphony in their Orchestrating Kids Through Classics program for the past three years (2014-16). She also performed a solo in their Music from the Movies concert in February 2015 and has been invited to play again in May 2016. In 2015, as a winner of several concerto competitions, she performed the Mendelssohn Violin Concerto in E minor with the Concord Orchestra, the Wellesley Symphony, and the NEC Youth Repertoire Orchestra. During summers, Hana has attended several prestigious music schools and festivals. Among them are the Musica Mundi Chamber Music Courses and Festival in Belgium (2013) where she studied with Leonid Kerbel and performed with Ivry Gitlis and Maxim Vengerov, the Kusatsu International Summer Music Academy and Festival in Japan (2012) where she studied with Saschko Gawriloff, and the NEC Festival Youth Orchestra (2011). For the past two summers (2014-2015), she attended the Meadowmount School of Music where she studied violin with Ivan Zenaty and viola with Patricia McCarty, and performed in a masterclass with James Ehnes last summer. Outside of music, Hana enjoys gymnastics, swimming, knitting, and reading. She lives in Shaker Heights, Ohio and is a 7th grader at the Shaker Heights Middle School. She currently plays on an Amati violin, kindly on loan by the Rin Collection in Singapore.